This LED light sensor lamp is designed with PIR human body induction, time adjustable, IP65 water-resistance and low consumption, it meets your needs when you get up at night. 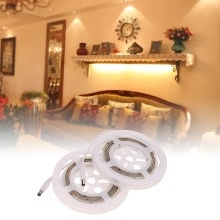 Simple design, easy installation method & 2PCS strip light are more convenient for your life. It&apos;s also beautiful as a decoration. TIME ADJUSTABLE: pressing the adjustable button next to each sensor to control each sensor delay time from 30 seconds to 10 minutes as your needs. It&apos;s more flexible to use, getting up at night is no longer a question. SIMPLE DESIGN AND INSTALLATION: two lamp strips with a socket, two sensors, installation kit and a deconcentrator & self-adhesive back with double side adhesive tape make it easy to install, no complicated operation. CAN BE CUT & SUPER BRIGHT: excellent 3528 SMD LED quality & 2 strip lights ensure super brightness, higher intensity and reliability, this LED strip light can be cut every 3 LEDs along the cutting marks according to your requirement.